"I do cater to unusual affairs. What do you consider to be unusual?" "Oh, I don't know. What do you recommend?" "Have you ever had... an Egyptian Feast?" The annuls of horror are stocked with legendary names: Lewton, Hitchcock, Castle, Carpenter, Cronenberg, Fulci and the list goes on. Such names hold an illustrious spot in the mind of horror fans. However, off in a dusty corner (or in the sleaziest of drive-ins) and far removed from such luster, there sits a heap of lesser-heralded names like Franco, D'Amato, and Kaufman. Resting at the top of this heap would be the "Godfather of Gore" himself, sleaze-king Herschell Gordon Lewis, who made a career out of trashy, drive-in exploitation. Lewis's defining moment would arguably come in 1963 when he unleashed the first "gore film" upon the world in the form of Blood Feast, a shlock-filled grue-fest that shocked drive-in audiences across the nation. In a small southern town, a caterer named Fuad Ramses is planning a very special feast in honor of the Egyptian goddess, Ishtar. Hoping to recreate the ritual sacrifices of ancient Egypt, Ramses murders various nubile young women around town and collects their body parts for his stew. His final ingredient is practically served up for him in the form of Suzette, a young woman who is having a dinner party thrown in her honor. Meanwhile, Suzette's boyfriend, a police detective, is hot on Ramses's trail. Will he stop the madman from resurrecting the long-dead Ishtar? First of all, let's dispense with the obvious: nobody ever accused Herschell Gordon Lewis of making a good movie, Blood Feast included. From a technical standpoint, it's barely competent: it's blandly photographed, poorly acted, and weakly scripted. That said, Blood Feast is immensely important from a historical perspective, as it's essentially the first splatter film. The level of violence exhibited was unlike any ever seen at the time. Unflinching, brutal, and somewhat staggering in its violent scope, the film is still quite violent by today's standards, which is not something you can say about many films of this era. If anything, Blood Feast is a required viewing in this respect, despite its technical shortcomings. 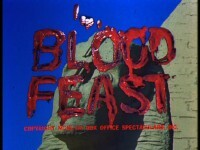 Of course, films can't exactly be judged strictly on the merit of their historical significance; as such, it's hard to call Blood Feast a true classic of fine cinema. However, it is strangely entertaining. Lewis is no doubt an acquired taste, but once you do acquire it, you're somewhat charmed by his kitschy atmospheres, his generic, droning, synth-laden "scores," and his bizarre characters. As notorious as Gordon is for his gore exploits, it's arguable that he's also one of the greatest camp directors of all time, as there's just something bizarrely fascinating about watching the prim and proper 60s cultures clash with the deranged violence that's perpetrated on screen. In many ways, Blood Feast is a time capsule for this phenomenon, as it seems to be standing in two places at once: with the more reserved films of the time and also with the over-the-top, violent splatter films that were to come. Mal Arnold's Fuad Ramses definitely falls in line with Gordon's other memorable characters, as Arnold's performance is definitely the strongest (which isn't saying much of course). There's a very deranged quality to the character that predates the hordes of overtly insane slasher maniacs of later decades. The violence committed by Ramses is surely the film's selling point, as the "script" is little more than a sequence of violent acts connected by some weak character moments. Still, at only 67 minutes long, Blood Feast moves quickly and knows what it is: an exercise in gross-out violence and nothing more. If anything, Gordon at least wears his heart on his sleeve and puts all his enthusiasm into the gore scenes and essentially delivers what drive-in audiences didn't know they were craving at the time. Bodies are sliced and diced in every way imaginable, and the camera rarely flinches, instead capturing all of the glorious grue. There's not much more to be said about Blood Feast; it's surely one of the first films with a pure exploitation aesthetic that throws artistic integrity to the wind, and it's only really "good" in this respect and paved the way for similar tripe. However, it's undeniable that Lewis does exhibit and cement his own style here. Say what you want about the man, but you know a Herschell Gordon Lewis film when you see it, and this one is among his best. The film was released on DVD by Something Weird Video and Image Entertainment, in a special edition package. The disc boasts a fine transfer featuring the film's original full-frame aspect ratio--sure, it's a bit grungy and scratchy, but the colors pop well, and surely it's better than the time-worn drive-in prints of yesteryear. Likewise, the audio isn't without a few hiss and pops, but it's serviceable. Extras include a commentary with Lewis and producer David Friedman, a short film entitled "Carving Magic," almost 50 minutes of outtakes, the film's original trailer, and other promotional material. The film was also released in a three pack along with the other "Blood Trilogy" films, Two Thousand Maniacs and Color Me Blood Red. A film that's no doubt more notorious and infamous than it is great, Blood Feast is an enjoyable and sometimes fascinating exercise in violence. As such, it's one feast you shouldn't miss. While you're at it, don't forget to take some second helpings with its sequel. Buy it!